A full refund is available at any time prior to shipping. It may also be possible to exchange your item prior to shipping. Please use "Contact Us" to send an message. If the item has already been shipped at the time that your request, the case will be treated as an ‘change of mind’ return. Please see terms and conditions for this return type below. · Your item may be eligible for DOA exchange if it is not working. DOA exchange is only available within 48 hours of receipt of the product. · In order to make a DOA exchange claim you are required contact us within the 48 hours after item delivered. Failure to contact us within the 48 hour period will result in your item being processed through the regular warranty process. · Upon we received your claim, we will sent a Australia Post return mailing label to your email, just print it out, and attached outside of the parcel, then take to local post office lodge it, no need to pay any postage, they will print a proof of posting receipt, just keep it as reference. · You need return the watch with original package together with manual, watch tag, warranty booklet and box to us. · Note: Make sure there have enough protection(use hard box or bubble wrap etc) for the watch and the box itself, so it will not damage during transit. · Upon we received the return watch, we will assess the watch, if found fault, we will sent a new watch to you. · Within 30 days from the date of products received, if the product is fault or defective, we will either replace or exchange or refund the goods. · Within 30 days from the date of products received, if the product is return for refund / exchange because change of mind (except pre-order replacement watch band or replacement watch band package has been opened). Restocking fee per item will be apply in order cover the cost of postage fee + Insurance. So total amount of refund/credit will be sale amount minus restocking fee per order. For order amount less than $300, restocking fee $10. · For the product return for refund or exchange, the product must be returned in its original condition, make sure all the contents(watch, watch tag, box, manual, warranty card, warranty booklet etc)are included and in 100% good condition without any physical damage (scratches,crash, flaws of any kinds etc.). o The returned watch is found worn, altered, shortening of bracelet, scratched or dirty. · Item should be carefully packed, make sure there has enough protection (hard box or bubble wrap) to protect the box during transit, shipped via traceable means. · We have to receive your return item first, then will process refund or exchange. · The customer is responsible for all the expense associated with the shipping and package for the goods return back to us. 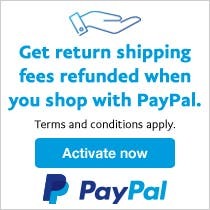 Note: Paypal is current offer refund the return shipping cost to buyer. For more information, please visit Paypal on following link, activate now to enjoy this service on your next purchase. · We are not responsible for any losses or damage in the mail or transportation while returning the goods to us for refund or exchange. · Pre-order replacement band or the replacement band package have been opened will not accept return for refund / exchange due to change of mind or buy a wrong band. · If the package of the replacement band have not opened yet, we will accept return for refund/exchange due to buy a wrong band. Restocking fee still apply. · For return or exchange, please contact us, before return the product.